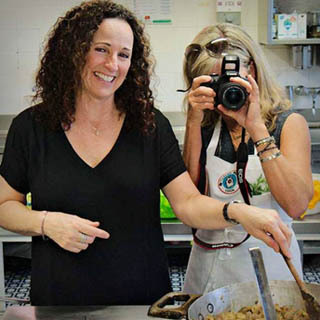 Tuscan Women Cook's Coleen Kirnan and Rhonda Vilardo. Your 24/7 hosts for a memorable week in paradise. Coleen and Rhonda’s personal relationships with the region’s best chefs grant our guests memorable cooking and dining adventures. Coleen and Rhonda provide exclusive access to some of the finest Tuscan cucine. Coleen and Rhonda will lead you to the best museums, shopping, and gelato in the most picturesque villages in Tuscany. Enjoy a relaxing foot soak in the historic hot springs of Terme Bagno Vignoni. You'll say "Salute!" often whether with Rhonda and Coleen or a fellow guest. Imagine having best friends in Tuscany who know all the best places to cook, dine and shop. They are on a first name basis with the best gelato makers and have exclusive access to the most spectacular vineyards where they’ll set up personal wine tastings just for you. These friends are also master travel planners, who take every travel detail off your plate and create an insider’s Italian itinerary filled with friendly, knowledgeable tour guides, translators, drivers and private cooking classes only a local resident could access. When you book a week with Tuscan Women Cook, Rhonda and Coleen become these extraordinary new friends, with contagious joy that will deeply enhance your Italian experience. Chances are you have come to a place in your life where it is finally time to take care of YOU. Rhonda and Coleen intimately understand this life chapter and relish the opportunity to create your new, personalized Italian experience. Once you arrive in Montefollonico, Rhonda and Coleen’s extensive connections with local families and businesses, culled from years of forging personal relationships with multiple generations, will immediately get you acclimated. Their regional knowledge and sincere love of all things Italian make them ideal companions who will confidently lead you from your empty nest, your harried work schedule or your auto-pilot daily routine and create your next authentic, life-changing experience. Theirs is a story of an extraordinary mid-life dream come true. Rhonda and Coleen have a knack for creating a memorable trip for every member of your family, even the kitchen novices. Guests who would rather leave the cooking to others will also have great Tuscan adventures thanks to Rhonda and Coleen’s extensive knowledge of the region. They’ve thought of everything, from shopping expeditions, spa days, and golf outings for friends and family members who are interested in venturing out of the kitchen. “There is truly something for everyone at Tuscan Women Cook. Many of our guests forge deep and lasting friendships and so do we,” confide Rhonda and Coleen. All roads lead to Tuscany for Rhonda Vilardo and Coleen Kirnan. Both women share an intense passion for cooking, entertaining, meeting new people, and travel. 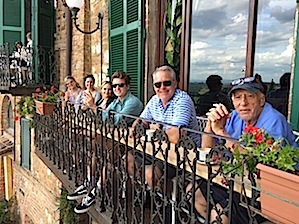 When not hosting Tuscan Women Cook in Montefollonico, they live in California with their supportive husbands and grown children (pictured above). With their enthusiastic blessing, Coleen and Rhonda embraced the idea of forging a business in Italy that encompasses all their favorite pursuits. Rhonda and Coleen want to thank their respective families for their love and encouragement, and their patience while they share paradise with their Tuscan Women Cook guests. See the sample weekly schedule of the Tuscan Women Cook cooking school.